In his Nouveau traité de l'art des armes, dans lequel on établit les ... Nicolas Demeuse (1778) speaks about wire mesh fencing mask: solid wire and frame (Chapter 46). Les bons masques doivent être légers, mais composés d'un fil d'archal solide et le grillage ou la maille ferrée. Il s'adapte á la tête par un ruban qui se noue derriere et ne gêne aucunement la vue. Il laisse tous les mouvemens libres et n'oblige a aucune attitude gênée. On devra convenir encore qu'un homme ayant recu un coup de bouton au visage et en craignant un second ou un troisieme, hésite de s'alonger, et a une forte de timidité qui l'empêche d'agir, et lui fait laisser conséquemment, dans un assaut, tout l'avantage a son adversaire qui ne manque pas d'en profiter. Le visage étant d'ailleurs une partie essentielle a conserver intacte, on ne peut prendre trop de précautions pour qu'il n'y arrive aucune difformité. The large blade always gives better results, while the narrow, although more manageable, turns in giving the sabre cut, and most of the time the blows turn out flat. For the assault, the following proportions are tolerable: 15mm at the base, 8 or 9mm at the point. The large blade he's referring to is likely the full sized 20mm tapering to 10mm blade that was specified for dueling purposes under his dueling code, and which he specifically sets out as the proper blade for use in his 'fencing on the ground', and appendix to the 1904 version of his book. "[T]he calm spirit is the only force that can defeat instinct, and render us the masters of all our strengths." -Capt. Settimo Del Frate, 1876. Author of "The Art of the Dueling Sabre". On the famous "decapitation photo". It seems that this "decapitation" photo was published earlier in Robert Baldick's (1927-1972) book The Duel: A History of Duelling (1965), somewhere on page 160 or 161 (if you search for sabre inside the book, then the first hit - on page 9 - gives you "sabre duel resulting in a decapitation * 161"). "... bei Amberger ist das Bild auch abgedruckt mit dem Verweis das es aus "the duel" von Robert Baldick (1965) stammt, leider nicht mehr Infos ausser das es um die Jahrhundertwende gemacht wurde." So yes, this photo was published in Robert Baldick's The Duel (1965). Christoph Amberger mentioned this fact in his book (1999). It would be nice to have the possibility to check Baldick's book. Ulrich von L...n wrote: On the famous "decapitation photo". This would be the book I remember seeing it in about 15 years ago or so. I just checked the Wichita Public Library's card catalog online, and they have it. It's walking distance from my office in nice weather. I'll see if I can't slide by there over the next couple days and have a look. Is there anything in particular you want me to check for? That would be really nice. Thank you very much in advance! Is there anything in particular you want me to check for? Only the origin of the decapitation photo. Is there any additional clue about this photo (country, date, circumstances, or from which book, private collection etc Baldick took it)? Is it possible to find any additional details on the photo itself? An uploaded photo of the whole page would be an additional bonus, but only if it doesn't take too much time to make. Ulrich von L...n wrote: Only the origin of the decapitation photo. Is there any additional clue about this photo (country, date, circumstances, or from which book, private collection etc Baldick took it)? It's on a picture insert between page 160 and 161 in the "Unusual Duels"section- simply captioned "Sabre duel, 1900, resulting in a decapitation". Baldick credits the help of H. Roger Villet, Paris in acquiring the image. In 1938, Hélène Roger-Viollet and her husband Jean-Victor Fischer, both passionate photographers and travelers, founded the “Documentation Photographique Générale Roger-Viollet” at 6, rue de Seine in Paris. Today, Roger-Viollet, still located in its original premises, is one of France’s oldest photo agencies. Having purchased the rue de Seine store from “picture merchant” Laurent Ollivier, together with his fine arts & geographic collections, Hélène Roger-Viollet and her husband added their family production and, after WWII, started increasing and enriching the archive by continued acquisitions. Over the years, the agency’s founders built a photographic collection unique in Europe, covering more than a century and a half of Parisian, French and International history: world events and “petits metiers” (small crafts), fine arts, science, politics and everyday life, exotic journeys and streets of Paris, portraits of celebrities as well as snapshots of unknown passers-by… The Roger-Viollet collections also offers an astonishing journey through the history of photography, from the production of the Second Empire photographical studios to late 20th century photojournalism. At their deaths, in 1985, the founders of the agency bequeathed the business and the collections (nearly four million negatives and about two million prints) to the City of Paris. In 2005, the agency was integrated into the Parisienne de Photographie group, a City controlled public-private partnership in charge of digitizing and distributing the French Capital’s photographic & iconographic heritage. In addition to the Roger-Viollet archive, the material distributed by the agency now includes images from the principal museums and libraries belonging to the City of Paris. Since 2005, the agency has enhanced its appeal and widened the scope of its offer by distributing foreign historical collections in France, as well as material by independent photographers who have entrusted their archives to its management. Caption: "Victim of a duel to the sabre having had the cut head. About 1900." Naturally thank you very much indeed for taking time to find the info about this photo. I have just written a short e-mail to the Roger-Viollet collection. I do hope that sooner or later we could have some additional information about this interesting photo. At least we have done our best to trace its origin. Nae bother- haven't dug out my copy of Baldick in years so nice to read it again (turns out it was being used to prop up an broken sofa leg so probably best moved to the bookshelf!). Ah! Very good. Saves me a trip to the library then. This nicely written blog entry by Ilkka - Training with Minimal Gear - isn't exactly about the early history of the modern fencing, but partly on our perception of how previous generations used protective equipment, especially in the 16-17thC. Learning more about the history of fencing masks before the invention of the wire mask would be an interesting and challenging thing. This has been already posted in Swordsmanship of the Russian Empire topic. Chris Holzman wrote: I haven't been able to find out really anything about Torricelli or Drosi. Together with Italo Santelli other Italian masters were invited in Hungary: Angelo Torricelli, Frederico Giroldini, Eduardo Armentano and many others. In 1899 the Szeged Fencing Association invited Torricelli to teach in Szeged (now the third largest city of the country, is situated near the southern border of Hungary). The association's statute was approved on October 31, 1899, so he arrived somewhere in the last months of 1899. Later Eduardo Armentano taught in Szeged, probably till 1914. Starting from 1901 an annual "international" fencing competition was held in the city. In February 1902 at this two-day event the best Hungarian foil and sabre fencers - László Berti, Ervin Mészáros, László Porteleky - participated. At the closing academia (non-competitive display of fencing skills) the most spectacular assault was between First Lieutenant Berti and Angelo Torricelli (Szegedi Napló, 1902. február 18.). Fencing master Gerentsér wrote in 1941 that he was the student of famous Torricelli between 1897 and 1898 in his hometown, Szeged. So from this we can be sure that in 1897 Torricelli was already in this Hungarian city. Gerentsér sang the praises of Torricelli's teaching abilities and flatly stated that Torricelli was the best pedagogue he ever met. Chris Holzman wrote: The original photo this image came from is hanging on the wall in my living room. I now believe the date is somewhere between 1889 and 1895. The reverse of the photo has part of the associated news story, which tells of a fencing exhibition on the 15th of May at the Teatro Quirino (in Roma), and then on the 23rd of May, an exhibition in London, in the Agricultural Exhibition Hall. It mentions that Conte Tornielli, Italian ambassador to England, was present. A little google-fu reveals that in 1889 Giuseppe Tornielli Brusati, Conte di Vergano, was the Italian ambassador to England, and that in 1895 he was sent to Paris. I haven't dug around much further to see if he was only in London a year, or if he was there for all the years between 89 and 95. It's a lovely photo, and I just had to include it in my book. As I recall, the ebay listing when I purchased the photo noted it as being from 1892. Ulrich wrote: From the records of Italian senate (notes9.senato.it) it is clear that Count Tornielli was Italian ambassador to the UK between October 1889 and February 1895. Because the fencing exhibition in London was held in May, then the time period could be further reduced to 1890-1894. Chris Holzman wrote: This was in fact 1892. There is another version of the same photograph - well, a different setting, but the same cast of characters, which specifies that it was a competition/exhibition in London in 1892. That photograph was published in Edoardo de Simone's 1921 history of the scuola magistrale. While searching for additional tidbits about Torricelli, the final piece of this interesting photo-historical puzzle has been found. Among the various performances at the Agricultural Hall has been the display of fencing with foil and sabre by representative instructors of the Italian army, under the direction of Cavaliere Masaniello Parise. Company-Sergeant-Major Agesilao Greco of the Field Artillery, is a master in the use of the foil, and his method illustrates the characteristics of the Italian style. With the sabre, Regimental-Sergeant-Major Vincenzo Drosi, Instructor of the 5th Regiment of Infantry, and Company-Sergeant-Major Angelo Torricelli, Instructor of the 3rd Regiment of Cavalry, gave a capital exhibition." "On Monday, May 30, his Royal Highness the Duke of Edinburgh was among the spectators. The exhibition of swordsmanship included an exposition, by Lieutenant-Colonel Cavaliere Parise, of the advantages of the Italian style. In this style with the foil, when the fencer is "en garde" his weight is distributed evenly between his legs, he parries with his arm bent slightly, and he advances with a terrible rush. As to the sabre, there was an illustration of the circular swing which follows the cut at the head or cheek." From French wiki article on Borsody. With the help of a Hungarian wikipedian his death certificate (Nr 81/1939, Budapest, 2nd district) and death notice has been traced. 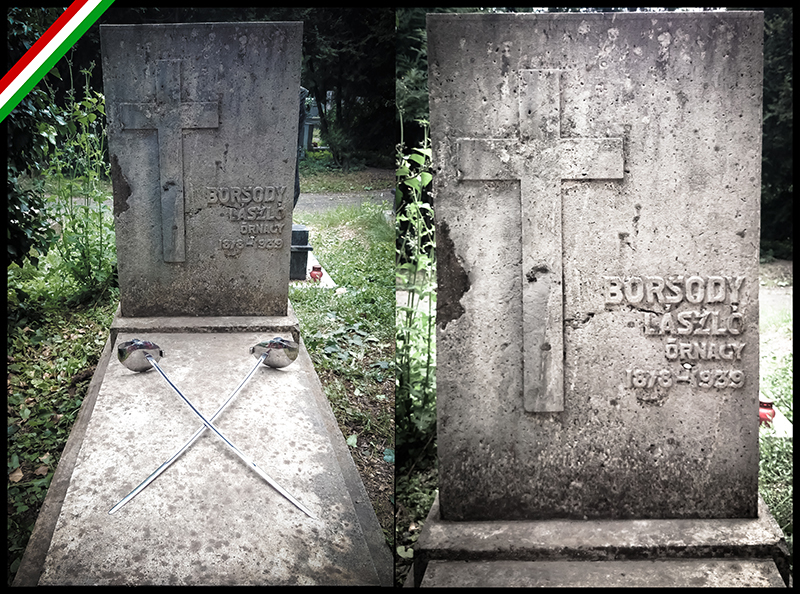 So the date of his birth and death, also details of his death can be confirmed: Major Borsody (Retired) (1878-1939) indeed committed suicide, his death certificate mentions a headshot, a fracture of his skull and the fact of suicide. From the date - January 25, 1939 - it is absolutely clear that all fantastical versions - the suicide due to the order to wear yellow star, and the suicide due to the fear of being deported to a concentration camp - are completely baseless, because those laws were introduced much later, in 1944. It seems that the first known depiction of a plate fencing mask with ties is from 1686 (blog entry, Fencing Material Culture, scattershotgaz.wordpress.com). However there are some tantalizing signs that protective masks were used several decades earlier. This bulletin can be found at archive.org in different formats (pdf, epub, djvu). Marked with a library stamp: "Philadelphia Museum, Library, College of Art"
The Museum's collection of European armor has been greatly strengthened by a recent purchase of fourteen specimens acquired at an important sale in New York. ...The most striking piece in the group is a French fencing mask of 1625. It is embossed with the verisimilitude of a face with long mustachios and a Louis Trieze pointed beard; the mouth and eye openings have upraised borders, to deflect the stroke of the opponent's blade; the eyelids, beard, and mustachios are ornamented with roping." Source: _____ By purchase, Keehmle Fund and Bloomfield Moore Fund"
The second one, simply placed in a gorget by a curator or originally attached to a gorget, is especially interesting, because it matches really close the description of the object from the Pennsylvania Museum. RULES FOR INDEPENDENT PRACTICE WITH SABRE OR STICK. 1. No one to play, on any pretence whatever, without wearing a helmet. 2. Cuts and thrusts are not to be given too strongly; should men appear to be losing their temper, their play is to be stopped at once. 3. No two cuts or thrusts are to be made on the same lunge. 4. The opponents should not both strike at once; should this happen the cut or thrust given in the third position to be considered effective. But should both parties lunge, the hit to count to neither. 5. The act of crossing (and touching) the blades is a guarantee that both parties are ready. Any hit given before this is done, is not to be considered effective. The opponents should always engage out of distance. 6. A disarm to count as a hit to the party effecting it. 7. A hit is only considered effective when given with that part of the stick which represents the edge, or with the point. 8. In stick-play, no hit is to be made at the inside of the leg unless the players wear leg padding, a blow in that part being highly dangerous. 9. When playing with the practice-sword it is neces­sary to wear full padding, that is, helmet, double-jacket, gauntlet, body-pad, and leg-pad. 10. Players are strongly recommended to fence for a fixed, number of hits, say 3, 5, or 7; this increases the interest in the play, and tends to make the men more careful in their fencing.